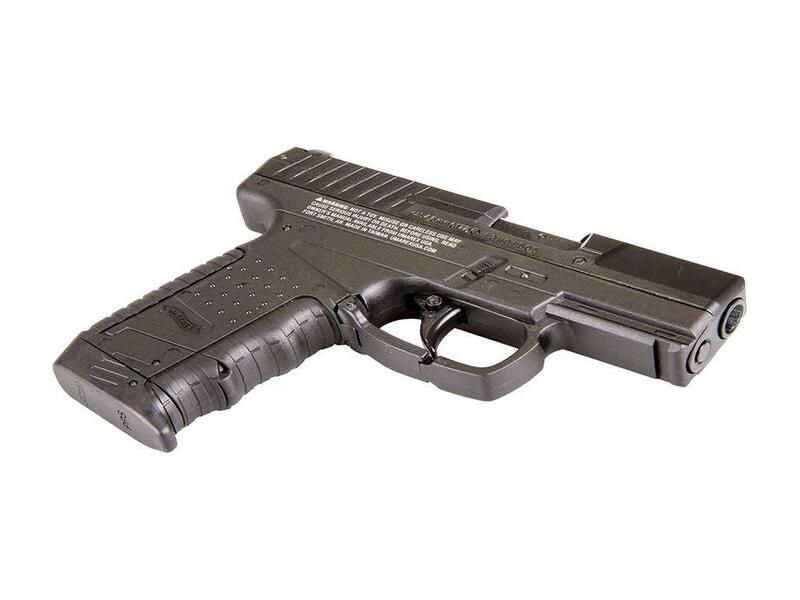 Umarex Walther CO2 Blowback BB Pistol | ReplicaAirguns.ca | Easter Weekend Sale! Trigger Pull: The trigger pull on the Umarex Walther PPS is pretty good overall. This pistol mechanically is very similar to the ASG Bersa BP9CC so it shares a similar trigger system that picks up a BB during the first part of the trigger pull allowing the BB to enter the barrel and then on the second part of the trigger pull the internal hammer is released. The hammer is set in the cocked position from the blowback action so the actual trigger pull is fairly light. You can feel a bit of friction when the BB is being moved into the barrel but it is not drastic. Overall trigger pull length is about medium with a very predictable release point. Accuracy: I did my pre-test of the Umarex Walther PPS CO2 Blowback BB Pistol from 30 feet back shooting at a paper target using a semi-rested position (sand bag up front and standing in the back). My 10 shot grouping was just a bit below the center bull's eye and very well centered left and right All 10 BBs stayed within 2 inches with a nice even spread. The Umarex Walther PPS also shot right around the 360 fps range on this not so warm spring day so I would expect it to hit significantly higher than the claimed 350 fps on hot summer days. Build Quality:The Umarex Walther PPS for its rather low retail price is very good quality; again comparable to the ASG Bersa BP9CC since I believe both guns are made in the same factory. The fit is very good, everything works well and the slide has next to no wobble. I especially like the way the Allen key is built into the CO2 hatch which allows for no need to a CO2 tab to have to accommodate with a bulkier but plate. The finish is also very nice - I did not see any wear mark appear with use and the plastic used in the frame seems to be very high quality. Realism: The Umarex Walther PPS BB Pistol is a fully licensed replica of the real steel Walther PPS compact carry pistol. It is an extremely close copy in both looks and feel, has a nice snappy blowback action and has a working slide catch release that hold back when the magazine is empty. The slide movement is shorter than expected but this does allow for better power and CO2 usage. It also would have been nice to have a full size drop out magazine but the stick magazine with its full size but plate does a nice job of still making this replica Airgun look very believable. Comments: I really liked the ASG Bersa BP9CC when I reviewed it because it was such a well-rounded gun in a very compact and well-built design. The Umarex Walther PPS perhaps exceeds the Bersa BP9CC since it is even more compact, seems to have a bit more blowback recoil while still retaining decent fps and accuracy, and the Umarex PPS has a superior design when it comes to the built in Allen key for tightening the CO2. You even get all of this for less cost than the ASG BERSA BP9CC. 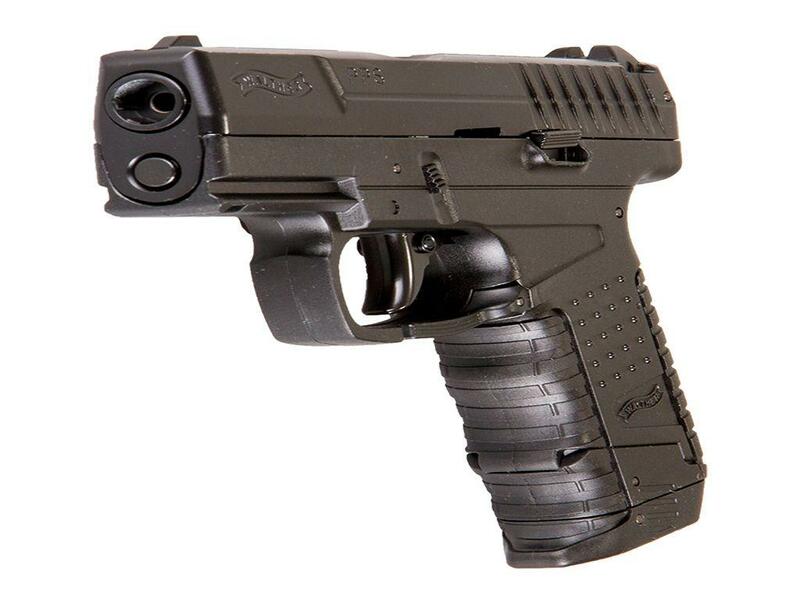 Don't get me wrong, I would not be without either gun, but if I could only have one it would be the Umarex Walther PPS. Really feels good in the hand, I would have given it 5 stars but my little plinking range is bit downhill in my backyard and the BBs roll outta the barrel constantly when your starting to squeeze trigger. Kinda annoying but it’s the only pistol I have that does this so not the end of the world. I just use it indoors now, it shoots a bit low and to the left and the sights are not adjustable but you can compensate for it. I honestly think it’s an Umarex thing as I have a Beretta 92 that does the same thing and I know it’s not me as my Cybergun 1911 shoots dead on from the same distance, same targets. 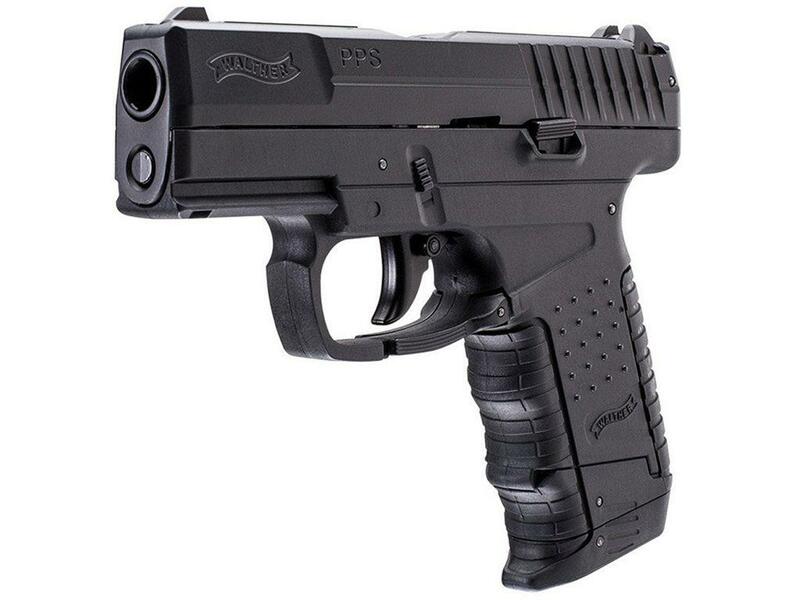 Still it’s a cool compact little pistol and for the money worth putting in your collection, everything works flawlessly, blowback, the slide locking back when empty, etc. Really nice to load BBs and CO2, well thought out. The pistol look good and seems well build but the slide after a few hundred shot broke in thefront thus making the gun unusable. This pistol has a unique feel in the hand, like a standard gun that's been run over and flattened by a steamroller. It's a wonderful tactile experience that is enhanced by the use of the high quality polymer materials Umarex selected. Does not feel cheap in any way, in fact it feels like a gun in the $130 range - equal to my CZ P07 for 'feel in the hand'.Unique paddle style magazine release takes just a bit getting used to before it becomes instinctive, working metal slide and slide stop add realistic operational feel. Good weight and heft to the gun.But what really left me gobsmacked was the amazing accuracy of this palm sized gun, which, with its dinky three inch barrel consistently puts rounds downrange at a rate of 85 percent within 1 inch of point of aim when handheld from 20 feet.It's small, stealthy, an incredible bargain, and highly accurate.Cons? The blowback is enough to cycle the gun but it doesn't kick a lot in the hand - again, on about the same level as the CZ P-07 only at half the price. I wish it had a full size magazine instead of the stick mag (perhaps a feature Umarex could put on the updated PPS MK 2 ?) And it comes in a plastic clamshell package (c'mon Umarex, my $3.00 pizza slice comes in a box why not a $70 airgun?) but don't read anything into that because make no mistake this is a high quality gun.All in all, a very good value and highly recomended. The cross bolt safety and paddle mag release are unique features in the airgun world, quality fit and feel, and insanely accurate shooting. My absolute favourite airgun at the moment. I wanted a compact for my collection, and this gun fits the bill nicely. Good weight, and great co2 usage...blowback is crisp for a small gun, and accuracy is what you would expect from a gun like this. Now for the warning...if you are left handed, and plan to shoot this gun left handed it isn't the gun for you. The silly safety on the trigger will not allow it to be shot left handed at all. No matter how you try the finger will engage the safety, and it will not fire. I am left handed, but shoot it right so I am speaking from experience. Overall a good replica..you wont be sorry...unless of course you want to shoot left handed! 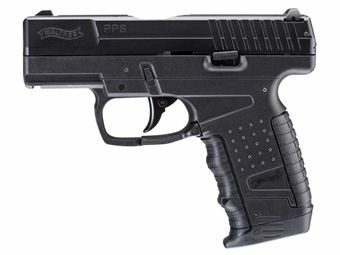 http://www.ReplicaAirguns.com - Umarex Walther PPS CO2 Blowback BB Pistol Table Top Review. 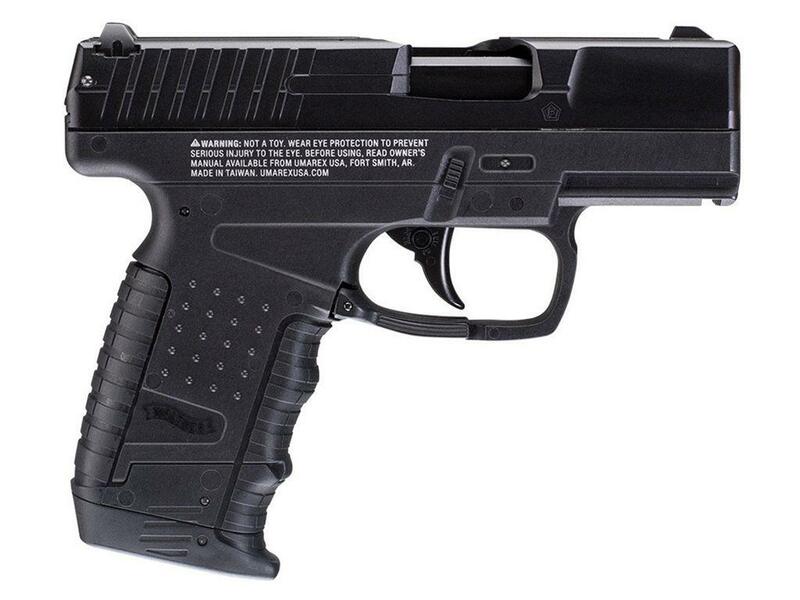 Type: BB blowback air pistol. Barrel: 3 inches, metal non-rifled. Action: Semi auto, single action only. Ammunition Capacity: 18 round full size drop out magazine. I really liked the ASG Bersa BP9CC when I review it because it was such a well rounded gun in a very compact and well built design. The Umarex Walther PPS perhaps exceeds the Bersa BP9CC since it is even more compact, seems to have a bit more blowback recoil while still retaining decent fps and accuracy, and the Umarex PPS has a superior design when it comes to the built in allen key for tightening the CO2. You even get all of this for less cost then the ASG BErsa BP9CC. 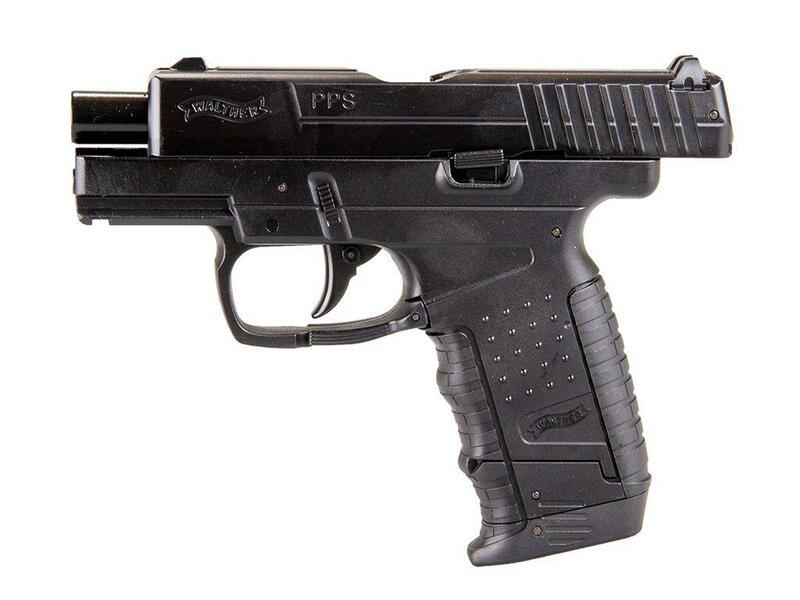 Don't get me wrong, I would not be without either gun, but if I could only have one it would be the Umarex Walther PPS.